Where Does Facebook Stand For Marketers? So, Where Does Facebook Stand For Local Business Marketers? Let’s take a quick look at some data and ideas. 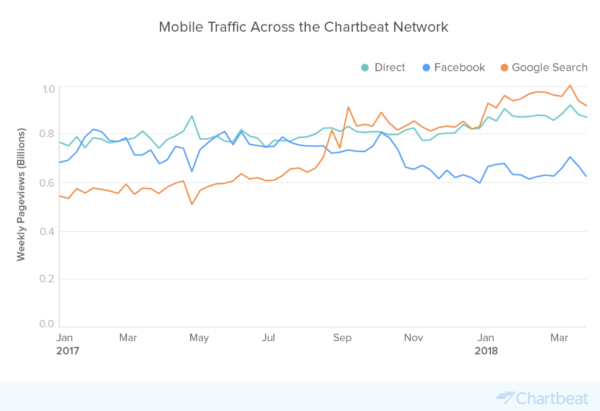 According to Chartbeat, direct traffic (e.g. measured part as visitor comes direct/ visitor browser set NOT to allow tracking) and traffic from ‘Google searches’ to business websites number higher than referral traffic from Facebook. In fact, that Facebook traffic has been declining since January 2017. At least traffic from people on mobile devices (see chart below) that is, but mobile is certainly a basis for traffic measurement and the data point is certainly very noteworthy. For a time Facebook was one of, if not, the most important sources of traffic for marketers. For some business owners it was critical to be active there…. and, so far as social media networks go, it still is the most enormous gathering place online! While the data above suggests Facebook is trending down as a driver of traffic to business websites, the opportunity as a potential source of traffic & leads should never be underestimated! In fact, when the work posted into any social environment is great, a positive side effect is often a social media presence that people will talk about … in the ways they personally like to talk online in these networks. While Facebook appears to generate less organic referral traffic (to business websites) in the chart above, it’s still the largest social network! And in spite of that data above ADVERTISING PERFORMANCE has actually improved a great deal, which keeps (considering its’ targeting capabilities and low cost) Facebook on the shortlist of potential traffic driving opportunities. 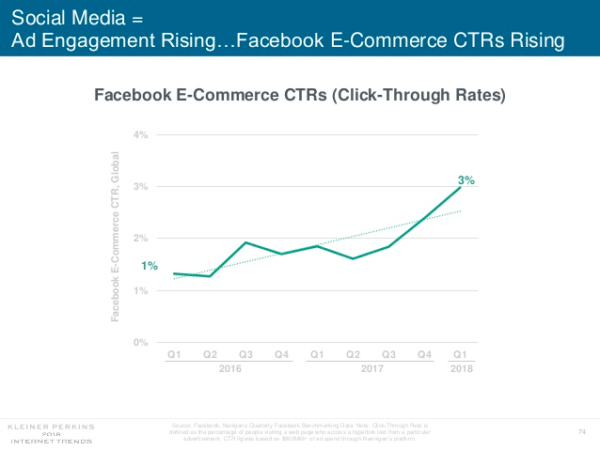 According to the latest internet trends report by Mary Meeker, the click-through rate of ads on Facebook has tripled since 2016. Consider that advertisements in social network environments are generally an interruption versus, for instance, being visible when a person is actually searching for something. When it’s a search it is a qualified individual actually looking for something with specific intent; whereas, with social networks like Facebook advantages may include getting to them early or branding, a low cost per eyeball and specific interests targeting. For local business marketers, social media should play a role in an online strategy; however, a brand’s website content and its’ ‘search engine optimization’ must remain priority! Timely, authoritative content that offers the best user experience possible has re- situated itself atop the list of traffic drivers … but Facebook still matters! It also offers rare and specific targeting capabilities, a definitive advantage! https://www.kineticknowledge.com/wp-content/uploads/2015/08/kinetic-knowledge-logo2.png 304 300 SrA504abMn https://www.kineticknowledge.com/wp-content/uploads/2018/08/KKLogoDarker-1.png SrA504abMn2018-10-23 15:55:202018-11-06 16:08:53Where Does Facebook Stand For Marketers? WordPress.com or WordPress.org – What Is The Difference? What Are The Best Practices For Business Blogging?